publish in Images on April 25th, 2008 by tiki god | Report This Post | Click to Add to favorites | Tags: Cute As Hell Animals, Science! Adds a whole new dimension to playing a game of croquet. Not to be mistaken for halo 3 equipment. ww, i wish I could do that…. i wonder what armadillo tastes like? 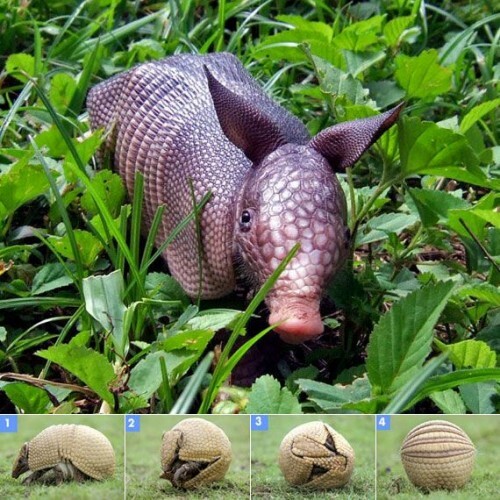 The one below must be the South American three-banded armadillo(Tolypeutes) since it is the only armadillo that can roll into a round ball. by the way hahaha damn armadillos! they even jump into their death when frightened too (road kill).